The verdict is in on the latest Simon-Ehrlich-type bet on natural resource prices and, again, Julian Simon wins. He [Simmons] expected the price of oil, then about $65 a barrel, to more than triple in the next five years, even after adjusting for inflation. He offered to bet $5,000 that the average price of oil over the course of 2010 would be at least $200 a barrel in 2005 dollars. Simon’s rule has to do with the ability of humans to innovate and adapt to changes in resource prices. The result is that prices of natural resources tended to stabilize or decrease over time. And that’s just what has happened. The average price of oil in 2010 was just under $80 a barrel ($71 in 2005 dollars)–well below the $200 threshold predicted by Simmons. The full story is here. Mark J. Perry has more, and also compares other resources. And PERC’s Linda Platts covers the story as well as the PERC Julian Simon Fellowship, a program designed for scholars to develop research on natural resources and environmental conservation. Clearly Simmons prediction was wrong. 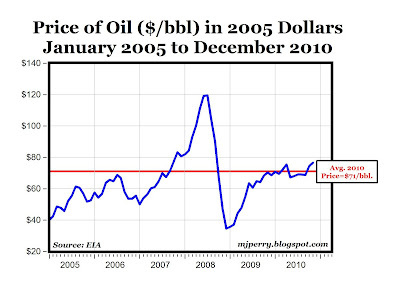 But is the trend in the price of oil since 2005 really a good example of Simon’s Law? What innovation or adaptation do you think explains the slow growth in the price of oil since 2005? Slumping demand owing to a global recession would seem to me to be the most dominant factor during the 2005-2010 period. I’m not sure that is a good example of Simon’s Law. Tierney cites growing domestic production of oil, but the growth in US production over the last couple of years is a tiny up-tick on a strong and steady decline in production since 1970. Where does that fit into Simon’s Law? No doubt the global recession played a role, but consider the long-run trend. Or here is another way of looking at the data. Also in PERC Reports, David McClintick and Ross B. Emmett do a good job of putting the Simon-Ehrlich wager in to perspective. And as Mark J. Perry writes (he’s recently joined in on a similar Simon-Ehrlich bet), 2010 was a very good year for new oil finds.